I am a well known potatoes eater, so much that my father, when I was little, nicknamed me potato (in Italian doesn’t exist the neuter gender, so for us potato is a female noun)! I love potatoes in any shape or form: roasted, fried, boiled, steamed, jacked… Give me a potato and I will be an happy woman! My search for the perfect roasted potatoes is going on since my first attempt of cooking. I read many recipes that were suggesting to shortly boil the potato chunks before to roast them in the oven, but it always sounded like too much fuss for something so simple… But it is not! It is the ONLY way to get a perfect crispy crust and a smooth, tender inside. They were so good! And they were wonderful even reheated in the oven the day after: still crispy!!! Peel the potatoes and cut them in big chunks. Putt all the chunks in a saucepan full of cold salted water and bring to the boil. Cook for 5 minutes. Drain the potatoes. In the meanwhile, put enough duck fat to cover with a thin layer the bottom of a big roasting dish. Heat it in the oven. When the fat is sizzling, add the potatoes (be careful with the hot splashes! ), coat them with fat and cook in the oven, turning once, for 45 minutes or until golden. Take them out of the oven, sprinkle with Maldon salt and serve straight away. 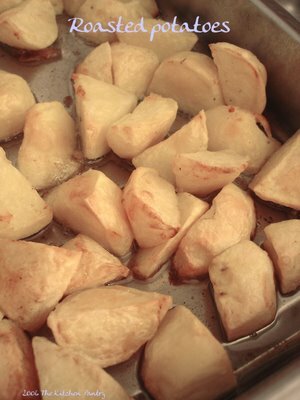 Parboiling is certainly THE best way to do roast potatoes! Another couple of tips I’ve learnt: after boiling, shake for a few minutes in a strainer to loosen the flesh, which will result in brown, crispy bits on the outside! YUM! Preheating the fat, like you did, is also very important. Choice of potato is quite important too… a waxy potato will not do the job – it has to be floury like maris piper! I will sure try this by heating the oil. Thanks! but Nigella said that the BEST fat is goose fat… not duck fat! Ducks are not so fatty… well, not fatty as gooses! Potrei anche smetterla con l’inglese, visto che sono italiana…. peraltro adoro le trasmissioni di Nibella e Nigel Slater! Fin qui mi son trattenuta dal commentare, ma oggi con le patatine proprio non resisto…anche a me incuriosisce questa tecnica, quidi per le prossime patate ci provo. Baci&abbracci, oh mia fonte d’ispirazione!!!! @Brazilian soul: assolutmente il grasso d’oca è normalmente considerato più untuoso di quello d’anatra, ma dato che in casa avevamo una quantità non indifferente di grasso d’anatra (dovuta al consumo smodato di confit de canard in scatola che si fa nella mia famiglia…) abbiamo usato quello d’anatra.